Looking for a preserve to bridge spring and summer? 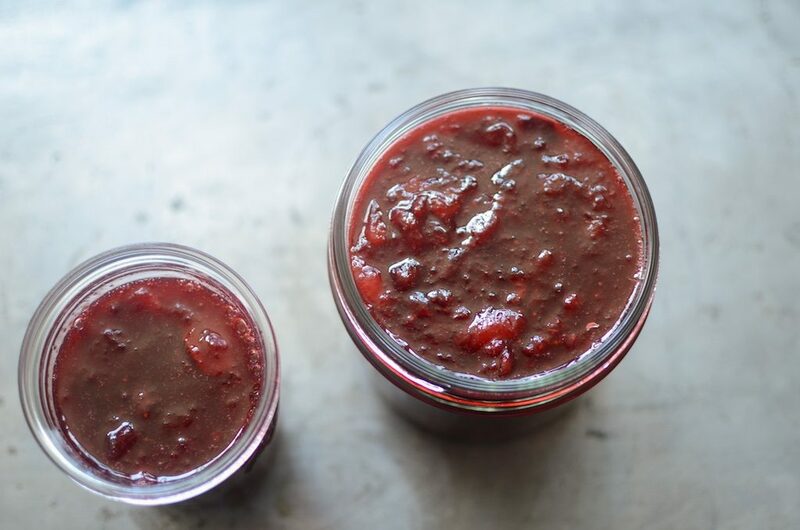 This small batch strawberry plum jam is just the thing to marry the seasons in delicious fashion. Last week, I had lunch with a canning friend. After doing a quick check-in about the general state of our lives, we got down to the real business at hand – dishing about our summer preserving plans. 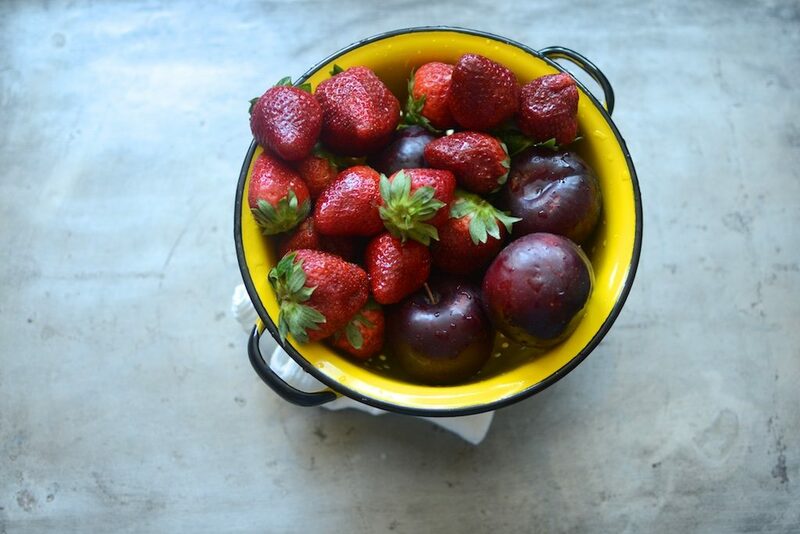 Lucia is planning on focusing on stonefruit this summer since they’re her favorite (and it was a terrible season for peaches and nectarines around these parts last year) and also hopes to do some classic strawberry jam to satisfy a plaintive request made by her partner. After spending so many seasons working on books and developing new recipes for various partnerships, my plan is to focus on restocking our beloved basics. Simple jams, plenty of fruit sauces (peach! nectarine! apple! ), lots of tomatoes, and a triple batch of my beloved roasted corn salsa (the recipe is in the Food in Jars cookbook). I am also hoping to get my hands on a goodly number of plums in the coming months. The local ones were almost entirely wiped out in the late freeze last year and so I’m totally out of plum jam and chutney (two of my favorites). We had plum trees in the backyard of my family’s LA house and so the flavor of plum preserves has the ability to instantly transport me to my early childhood. I need a little of that taste memory in my life. I will confess that I have already dabbled with plums this year. They traveled many miles to reach my grocery store, and while they wouldn’t have been particularly delicious to eat out of hand, in combination with strawberries, sugar, and a little lemon juice, they brought texture and deliciousness to a small batch of strawberry plum jam. And remember, the best pan for cooking up these small batches of jam isn’t always your beloved dutch oven or copper preserving pan. I like to use a wide pan with low sides because it means that the jam will reduce quickly and evenly. The pan pictured in this post is the Lagostina Martellata Tri-ply Copper 5-Qt. Casserole which they nicely sent me awhile back for review purposes. My review? It’s a lovely pan that’s good for jam making and so much more! Prepare a boiling water bath canner and 3 half pint jars. 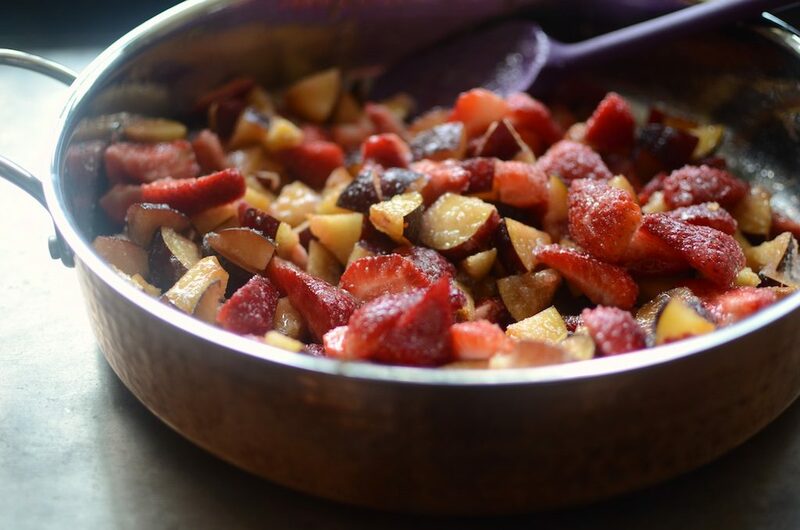 Combine the strawberries, plums, and sugar in a low, wide pan and let it sit for 10-15 minutes, until the sugar begins to draw liquid from the fruit. Once the sugar has begun to dissolve and there's plenty of juice in the pan, place it on the stove over high heat. 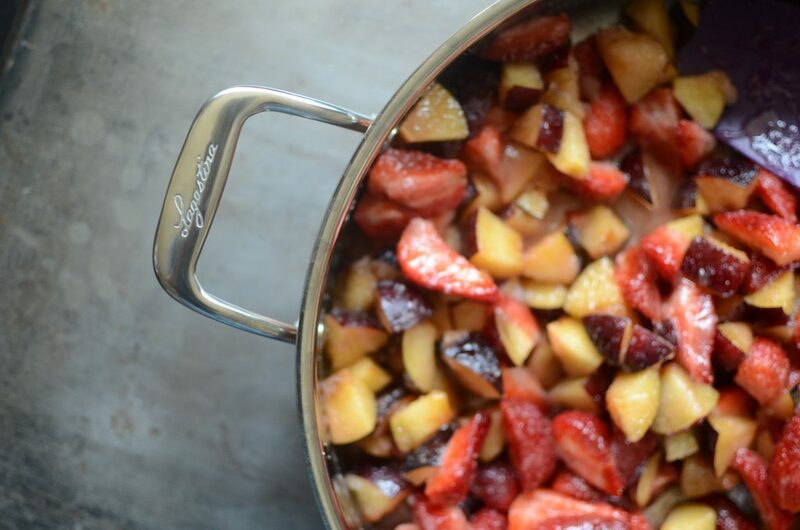 Bring the fruit to a boil and cook, stirring regularly, until the fruit has softened and the liquid has reduced. Towards the end of cooking, use a potato masher to break up any large bits of fruit. Add lemon juice and stir to combine. 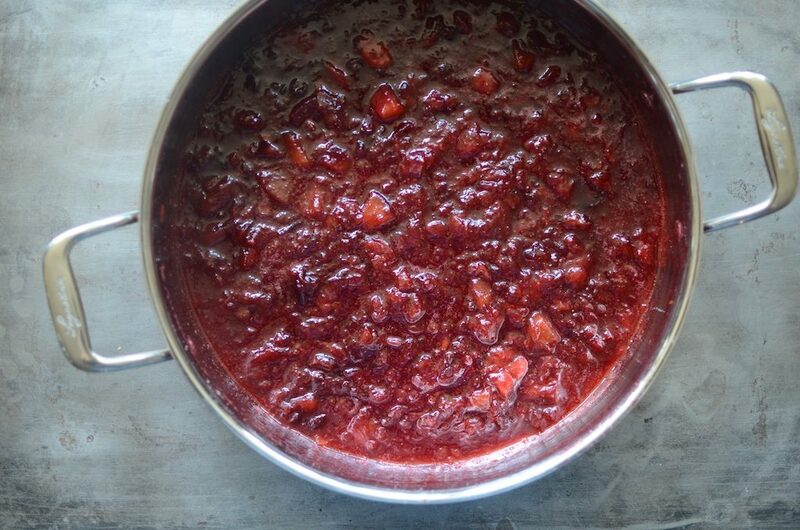 When the jam has thickened sufficiently, remove the pan from the heat. Funnel the jam into the prepared jars, leaving 1/2 inch headspace. Wipe the rims, apply the lids and rings, and process in a boiling water bath canner for 10 minutes. When the time is up, remove the jars from the canner and set them on a folded kitchen towel to cool. When the jars have cooled enough that you can comfortably handle them, check the seals. Sealed jars can be stored at room temperature for up to a year. Any unsealed jars should be refrigerated and used promptly. So it is OK not to blanch and peel the plums? You never need to peel plums! is it a pound after you’ve taken the pits out, or before you take the pits out? Great question! Ditto what Kyla said! A pound before you take the pits out. Link to the copper pan does not work, just fyi. Thank you for letting me know! I will fix it! So don’t need to use sure jell? Nope. This is a recipe designed to work without additional pectin. Can I use nectarine with the plums and strawberries too? I’ve not tried it, but I don’t see why not. I wouldn’t do it. Without additional pectin, a larger batch won’t set up well. Hi. I made this yesterday, but the jam seems to have a bitter edge. Any ideas as to what I may have done wrong? Thanks, Marissa, for this recipe. I just made it today with what is probably the last gasp for fresh strawberries. The jam is such a beautiful color and a great taste. The small batch recipe size is perfect. I will think fond memories of you this winter when I open up a jar! I opened a jar that had no visible mould on top but had a slight mouldy taste to the jam. I threw the jar away but I am wondering could this have been caused by strawberries that may have had mould on them that I didn’t noticed when I was cleaning them? I have never experienced this before and have done a lot of canning. Kirsten, I’ve not experienced that either so I’m uncertain how to advise you. The basic rule is that if you feel uncomfortable eating something, you should throw it out (which you did).